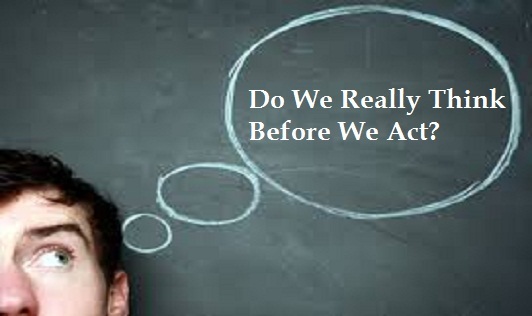 Do we really think before we act? Thinking is an inherent capacity of human beings. We think all the time. In some scenarios, we deliberately form thoughts. We may ponder upon new project ideas to be discussed in the meeting or we might think about the things we want to do the next weekend. However, even when we are not thinking deliberately, we do form our opinions about almost all of the situations. We might not realize it though, because the thoughts that we have are spontaneous. This type of thinking is described as automatic thinking. It can be seen as the first impression that we form on every situation we face. These automatic thoughts then lay a foundation upon which we base our future deliberations, decisions, and plans. But, are we always right about our first impressions? Turns out, most of the times, we form faulty first impressions, which then can lead to misunderstanding, mismanagement, and a failure to plan well. This, then, gives way to increased stress and anxiety. If not deliberated upon, the thoughts can get ingrained into a more permanent thought system eventually leading to more problems at both, an interpersonal level and in work-life situations. Overgeneralization. This refers to forming conclusions based on a single event. Using words llike "always", "never" and "all the time", is a part of this fallacy. For example, "If my coworker refuses a favor, I will form a conclusion that my colleague always refuses to help". Dichotomous Thinking. This means seeing only two possibilities of every situation. Thinking that everything has to happen in either of the two fixed ways. There is no in between; "If I my performance is not up to the mark, I am a failure in life". Filtering. This happens when you maximize or focus only on the negative aspects of a situation and minimize or neglect the positive happenings. For instance, "I focus on how I was criticized today while ignoring the fact that I also got praised". Personalization. It occurs when we blame ourselves for the events that cannot be controlled entirely. For example, "I blame myself for the difficulties that my husband faces at work". Blame. This is the opposite of personalization. Here, the tendency is to blame others for the situations they cannot control, such as, "I blame my spouse for the hard time I am having at work". Catastrophizing. This happens when you blow the events out of proportion. For example, "I mispronounced a word during a meeting. It is probably the reason why the client rejected the proposal". 'Should' or 'Must' Statements. These refer to our set standards, and our expectation that everybody behave according to those standards. A person using a lot of ‘should’, ‘ought’ statements might sound too critical of themselves and others. Labelling. This points to extreme black and white thinking, such as attributing the events to the character of the person and not to the situations which led to those events. For instance, "I reached work late today, so I am a loser". Emotional Reasoning. It is a cognitive process of assuming that reality is what one feels; "I feel scared every time I board a train, so travelling by trains must be risky". Fallacy of Change. It occurs by believing that other people should alter their behavior according to what we find pleasing or appropriate. Mind Reading. It is again an assumption of knowing what people are thinking. Optimistic Bias. It is also called as unrealistic optimism; thinking that one is immune from negative things. Smokers often think they will not suffer from cancer in spite of knowing that smoking is one of the risk factors associated with cancer. Assumed Similarity. It is the process of assuming that everybody is the same; will react, behave, think, and feel the same way. Individual differences are not considered. For instance, "I do not mind being made fun of; so others may not mind me poking fun at them". Errors can be avoided if we just wait for a moment and rethink. There are high chances that we correct ourselves many a times. Taking time to think is always better than making hasty decisions, and then regretting those actions.